You meet a lot of interesting people along the trail, but some stand out from the rest. Greg Wheeler is one of those people. I met Greg and his wife Donna as I was cycling south of Corwin on Memorial Day. As we rode along Greg indicated that he once had a bike like mine, a Rans short wheelbase recumbent. He then tells me that his current bike has taken him enough miles to circle the world—about 24,900 miles. This is amazing! But what happened to Greg’s Rans bike? It turns out Greg is the man who was struck head-on by an ATV on the trail just north of Corwin back in May 2009. Some of you may remember this story as Greg was nearly killed and his bike was totally destroyed. He was air lifted to Miami Valley Hospital in Dayton for emergency care. He was left with 10 broken bones, and doctors were not sure he would be able to walk again. But after a long rehabilitation, Greg got back on the seat of a new bike and continued to ride. Doubly amazing! Greg lives in Harbor Springs, Michigan and enjoys our trails so much that he takes a week of vacation every year to come down and ride the trail system around Xenia. 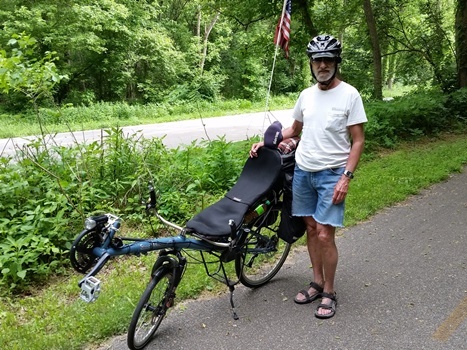 He has accumulated about 75,000 miles on his recumbent bikes over the years, 3 times around the world.